In this age of digital revolution, it is high time that we act wisely and be tech savvy to use the internet safely. To let female university students know about the internet safety and how to remain safe from the extremist groups or perpetrators online , Preneur Lab Limited with the support of USAID hosted a “Workshop on safer use of internet among university students” on 7th October, 2018 at BRAC University. It was a three hours hands on workshop where participants learnt about the basic internet security,identifying the fake news or websites, ICT act section 57 and digital security act, how to combat against cyber bullying and trolling, social media etiquette, online privacy issue and reporting criteria in Facebook and YouTube, beauty in diversity and uses of the internet for a bright future etc. The participants were so enthusiastic and gladsome as there were some exciting individual and group games. Certificates and slight refreshment were provided to all those who have taken part and completed the session. Respected USAID officials were present during the workshop. In the meantime, Mr. Arif Nezami, Managing Director of Preneur Lab Limited, paid a visit and inspired everyone with a high gear to enjoy the workshop and use this experiences in their future life. To conclude the workshop, Mrs. Rakhshanda Rukham, Chairman of Preneur Lab Limited, thanked everyone for their support and enthusiastic spirit due to which the effort triumphed. 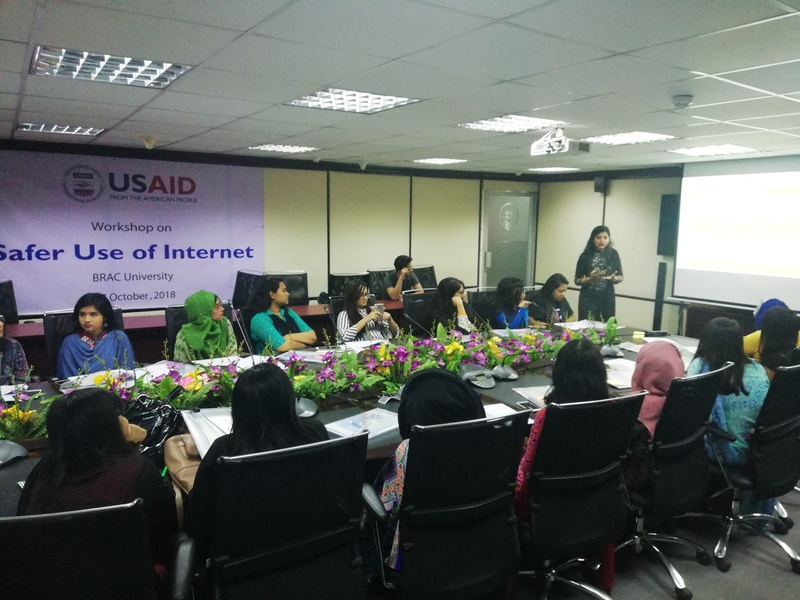 Ms. Farhana Rupa, Ms. Irin Jahan Asha, Ms. Jannatul Ferdous Rose and project coordinator Mr. Alif Uz Zaman Khan and every volunteers made this event a tremendous success and the participants were able to get a glimpse about safety and privacy of the vast internet world. Preneur Lab Limited will be conducting the same workshop in Joggonath University and IST University in the end of the month.